As the picture suggest i bought myself an iPad. 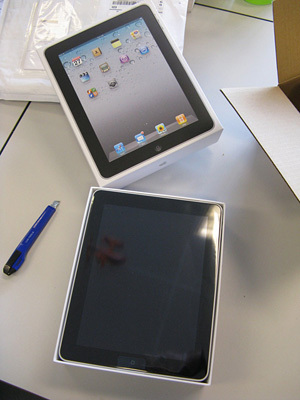 Since iPad 2 is coming out the first version was a lot cheaper. Cheap enough for me to not wait for an awesome Android tablet. I was planning to buy an e-reader anyways before this came along. So after using it for 24 hours time for some impressions. It is nice to use for twitter, Facebook and reading my mail. Also as an e-reader it has a lot of potential. I am using it now to read a book about android development (the irony :-) ). And I already read my first Suske en Wiske on it. Browsing is something to get used. Awesome to do it while lying on the couch. But apparently I use quite some sites with flash.